Female Sapsucker-what about her face? 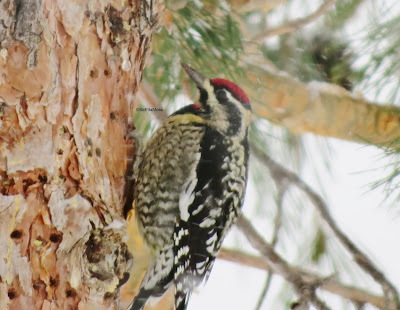 The Birdfellow website has some discussion about the differences in sapsucker facial markings and this is posted by Dave Irons: "Generally speaking, the face of a Red-naped Sapsucker has a rather broad and nearly solid black auricular (behind the eye) stripe that is bordered above by a somewhat narrow white supercilium (above the eye) that tends to narrow anteriorly. Conversely, the dark auricular stripe on a Yellow-bellied is noticeably narrower and is often mottled with paler tipped feathers. The supercilium on Yellow-bellied is wider overall and tends to broaden a bit behind the eye. 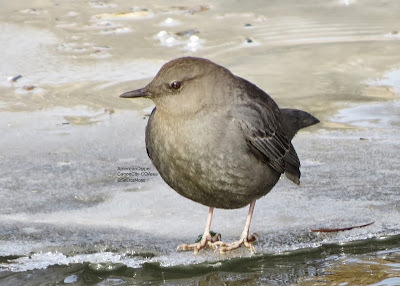 These differences account for the face of a Red-naped looking more dark than light, while the face of a Yellow-bellied tends to look more light than dark." Female Sapsucker-what about the nape? In the previous photos of the female sapsucker the nape area was not in view and this is an important area as we know for separating Red-naped from Yellow-bellied Sapsuckers. 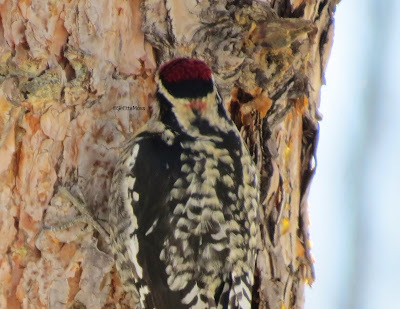 As noted in several references " Male yellow-bellied sapsuckers can rarely show some red on the nape" (from NationalGeographic.com); however, this is not noted for female Yellow-bellied Sapsuckers. 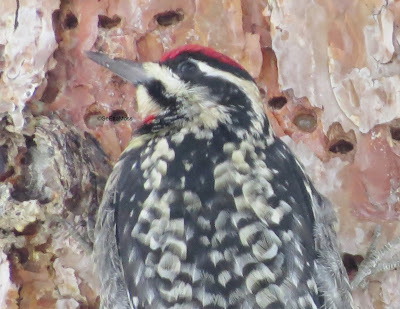 As seen in this photo, as well as in the field when I put my 40X Zeiss spotting scope on her, this sapsucker has a small amount of red on her nape. Below is the scoring examples from Migration Research Foundation-McGill Bird Observatory chart--I rate this again as right smack in the middle between "traces of red' and 'red restricted to about half-length or half width'.